Nestled in to the the north of Colorado Springs is Northgate, a hidden retreat for those that seek to get out of the city and onto the golf course or into a nice easy chair with spectacular mountain views out of the window. There are several neighborhoods in the area from the established and refined homes of the Gleneagle neighborhood to the burgeoning Flying Horse Country Club estates. The median sale price of homes here is $345,000; however homes regularly sell here for as low as $200,000. Northgate is one of the newest areas of development in the region with many retail and office projects underway; and now is a great time to get into this growing area. Some of the other neighborhoods here are Northgate Highlands, Serenity Park, Struthers Ranch and Stone Crossing, just to name a few. Rest assured that you are very likely to find what you are looking for in the Northgate area. Directly to the west of Northgate is the Air Force Academy with its picturesque chapel in front of a backdrop of mountains. Northgate Rd and Voyager Pkwy both provide easy access to I-25, making the drive south to downtown Colorado Springs and Fort Carson a breeze. Highway 83 provides a nice country drive through Black Forest and on eventually to Denver. 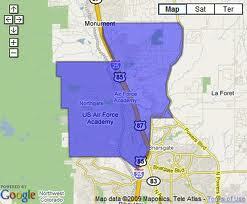 Powers Blvd to the south gives access to hospitals and shopping in East Colorado Springs. There is also the Colorado Mountain Brewery and the new Hollywood Imax Theater for a fun night out. The highly accredited School District 20 is the primary district in the area and most students attend Air Academy High School and many of the elementary age students go to the da Vinci Academy. Many students of all ages and gradelevels also attend the Discovery Canyon Campus. With the comfortable living, excellent schools, golf courses and so much more, Northgate is a great place to call home. Search the #1 site for Northgate Real Estate listings.